Every once in a while an opportunity comes along to share with a new audience what living simply luxuriously is all about, and over the past nine months, Portland’s KATU-TV’s Afternoon Live has invited me on their program to share bits and snapshots of the life I love living and share here on TSLL blog and podcast every week. This past Wednesday, I made my way to Portland (take a look at a few pics on IG here of a few places I explored – more to come later as I found a lovely French restaurant that is a must visit!) to be a guest on two different segments during their Wednesday show. From talking about mastering your money to building your own cheese platter, being on set with Tra’Renee Chambers is quite fun which makes it easier to quiet any nervousness that inevitably arises when you remember you are about to go on live television. As I took Instagram followers behind the scenes in the IG Stories, many people also have asked about preparation: hair, makeup, the food prep for the second segment, etc. , and the entire experience each time has offered a wealth of lessons in the best possible ways. For instance, I am, as are all of the hosts and anchors on KATU, entirely responsible for my hair, make up and wardrobe. As well, setting up my station was my responsibility, and while I learn from each mistake I have made, little or not, the crew on set makes it easy to just talk about what I love. Be sure to take a look below at both videos, and if you want to learn more about how to build your own cheese platter, take a look at this post or flip to chapter 11 in the book where everything that is discussed on air as well as much more is shared in detail. 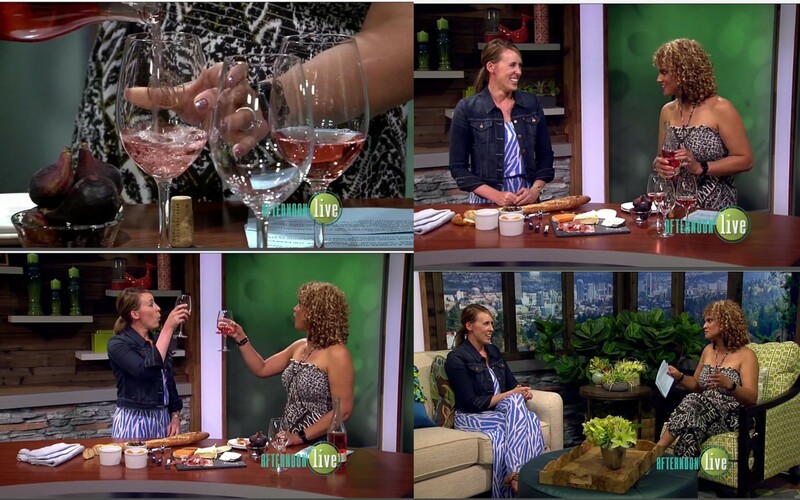 ~the rosé was truly delicious, and is from Sokol Blosser winery in Oregon. Have a look and shop it here. I picked my bottle up from my local Newport Market for $17. ~See the previous Afternoon Live segments from October 2016 and December 2016 here. You did a great job on both segments. Congratulations Shannon! Thank you Debbie. 🙂 Tra’Renee truly makes it so much more comfortable. Yet another successful appearance! And this time 2 segments, not just 1. It must be very gratifying to have your hard work and focus on the blog — something nurtured in the margins of what many would find to be an already tight schedule consumed with teaching full time and building a life in Bend — bring so many opportunities your way. Yea for you! Congrats! What a cool feature! Congratulations!!!! You did a great job. I used to do TV and I know it can be difficult, with the director talking in your ear.